After Flipkart facing markdowns in valuation to the tune of 20-40% from US mutual funds, another Indian tech unicorn is now under scrutiny. The brokerage arm of HSBC—which initiated coverage on Info Edge (India) Ltd, the largest shareholder of Zomato—cut its valuation of the restaurant listing site by half to $500 million. Zomato, however, has dismissed the HSBC report. But Flipkart and Zomato are not the only ones. Many global internet companies, too, are battling this downtrend. Uber, LinkedIn, Twitter, Airbnb, Snapchat, Dropbox, Cloudera and Palantir are some of the internet stars that have been devalued by 15-60% in the past year by some of their mutual fund investors. Publicly traded stocks of NYSE-listed Twitter and LinkedIn have fallen as much as 61% and 39%, respectively, from their peaks. 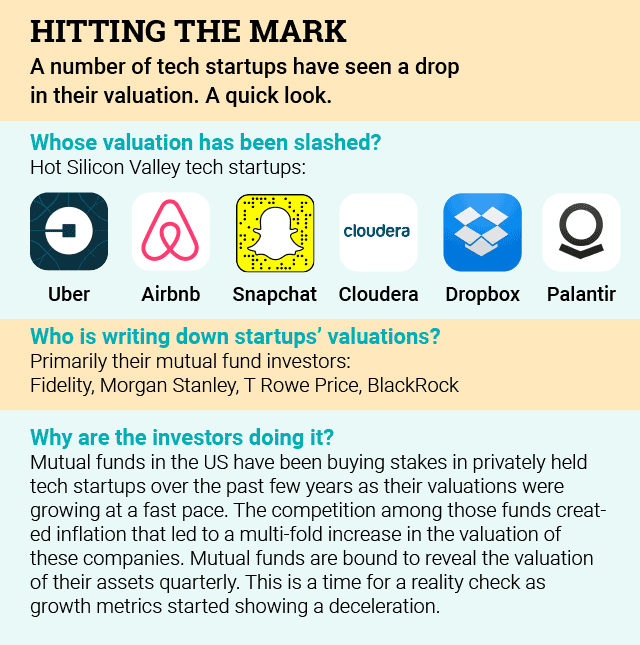 The mutual funds have not given any reason for the sharp cut in valuation, but analysts say the markdowns were preceded by an inflation in their valuations when these mutual funds pumped in millions of dollars into these startups. BlackRock Inc., Fidelity Investments, T. Rowe Price Group Inc. and Wellington Management run or advise mutual funds that own shares in at least 40 closely held startups valued at $1 billion or more apiece, according to a report by The Wall Street Journal. The flood of money into startups pushed their valuations higher. The number of VC-backed private companies valued over $1 billion was 146 as of February this year, against 45 two years earlier, the report said. Flipkart, which was last year ranked among the world's top 10 startups, is subject to the growing skepticism among investors with four mutual funds—Fidelity Rutland Square, Valic Co 1, Morgan Stanley and T Rowe Priceâ€“marking down the value of the shares in the Indian company. These investors now value Flipkart between $9 billion and $11 billion. It is quite a climb down for Flipkart, whose valuation rose 15 times in four years to $15.2 billion by mid-2015. Flipkart co-founder and executive chairman Sachin Bansal has shrugged off valuation concerns. He said late last month that the markdown was a theoretical exercise and not based on any real transactions. However, critics of Flipkart's growth model do not quite agree. "Look at Amazon stocks. It is growing," said Mahesh Murthy, co-founder Seedfund. "Flipkart is the only one among the Indian ecommerce companies which got devalued," he said. Amazon's stock price has gained 55% in the past year. 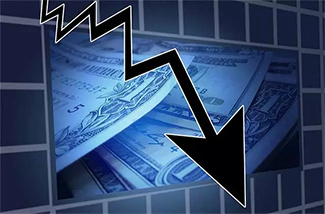 In a recent article, Haresh Chawla, investor and a partner at India Value Fund Advisors, said Flipkart was in the middle of a crisis of its own making and observed that half of its gross merchandise value was from selling mobile phones, which was unsustainable. Like Flipkart, Zomato has also downplayed reports of a markdown. "We have not raised any round since the last round of funding to have a valuation reset," said the company spokesperson. "HSBC has never spoken to us, and doesn't obviously understand our business well," the spokesperson said. Deepinder Goyal, co-founder and CEO of Zomato, wrote in an internal mail to employees that the company's existing investors were "bullish about us, and are willing to back us further, if needed". The skepticism among Flipkart's investors and the brokerage firm that evaluated Zomato's performance clearly show a change in sentiment. They conform to the overall slowdown in the Indian tech funding scene. The fund crunch is more visible at the early-stage levels. Earlier this year, nine out of 10 investors who participated in the VCCircle venture capital outlook survey predicted a drop in valuation in Series A,B,C and D deals. Almost half of them said exit valuations will be lower in 2016. Data from VCCEdge, the data research arm of VCCircle, has also shown that the valuations at Series B and C levels significantly shrank in the first quarter.